The Vigor2862L router has most of the functions of the Vigor2862 series routers, plus a slot for a 4G LTE mobile broadband SIM card. The supported SIM cards include those from the major broadband service providers in Australia, Telstra, Optus, Vodafone, etc., as well as those in New Zealand, Spark, 2Degrees and Vodafone with speeds up to 150Mbps downstream and 50Mbps upstream. 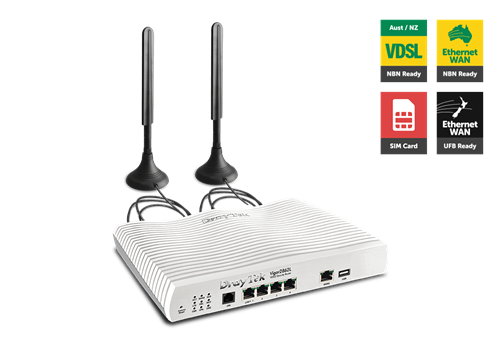 In addition to the 4G LTE mobile broadband, the Vigor2862L has other WAN interfaces including 1 x VDSL2/ADSL2+, 1 x Gigabit Ethernet WAN and 1 x USB port for a 3G/4G mobile dongle. The Vigor2862L can connect to the Internet through any of these interfaces, or with a combination of interfaces for Load Balance and Failover functions. Like the Vigor2862 series, this router supports business features including an object-oriented SPI (Stateful Packet Inspection) firewall, IPv6, 32 x VPN tunnels (including 16 x SSL VPN tunnels), tag-based VLAN, multiple subnets, etc. For mission critical applications, the Vigor2862L router can be used in High Availability mode to provide uninterrupted network connectivity, if there is a hardware failure occurrence in the primary router. Remote locations with no fixed line or UFB coverage. The Vigor2862L series router can be rack mounted using a 1RU rack mount bracket on a standard 19” rack or cabinet.